Thunder Breakers are melee fighters who are blessed by the spirit of lightning and water, using sharks in various skills. They use knuckles as their main weapons, and they can fight at close or fairly long range. 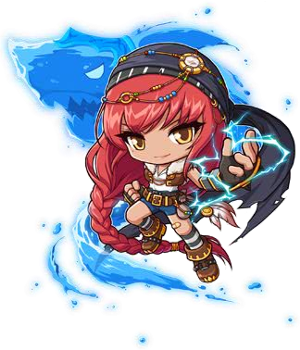 Thunder Breakers have a chaining system that allows them to chain almost all their skills together, reducing their relay and, starting in 3rd job, increasing your damage. In addition, they also ignore 5% enemy defense for each Lightning buff accumulated from the Lightning Elemental skill in 1st job, and you gain a stack at a chance while attacking. At first, you can only gain 1 Lightning stack, but with each new Lightning upgrade (Electrified in 1st job, Lightning Boost in 2nd, Lightning Lord in 3rd, and Thunder God in 4th), you can raise the maximum stacks by 1 for each skill (up to 5 with these skills). In 3rd job, you obtain a new skill called Gale, which uses up your accumulated stacks and gives you a damage boost, but it has a cooldown. This skill is further upgraded in 4th job with Typhoon. At level 150, you unlock the hyper skill Primal Bolt, which allows you to spam Typhoon without a cooldown or any Lightning buffs, but you gain no damage boost from Lightning buffs (this is made up for since with this skill active, you ignore 9% enemy defense for each stack, and you gain a 25% damage boost. In 4th job, you also gain a new 1v1 skill named Annihilate, which starts out with 2 hits, but gains 1 attack count for each Lightning buff. This page was last edited on 24 April 2014, at 05:46.